Product categories of Electrode Dryer, we are specialized manufacturers from China, Electrode Dryer, Electrode Drying Oven suppliers/factory, wholesale high-quality products of Welding Rod Heater R & D and manufacturing, we have the perfect after-sales service and technical support. Look forward to your cooperation! The electrode oven is heated by the power supply of the Welding Machine so as to prevent the drying welding rod from being affected by moisture in the air. When used in the field, the moisture content of the medicine cover can not be more than 0.4%, and the medicine coating can not be aged and stripped. 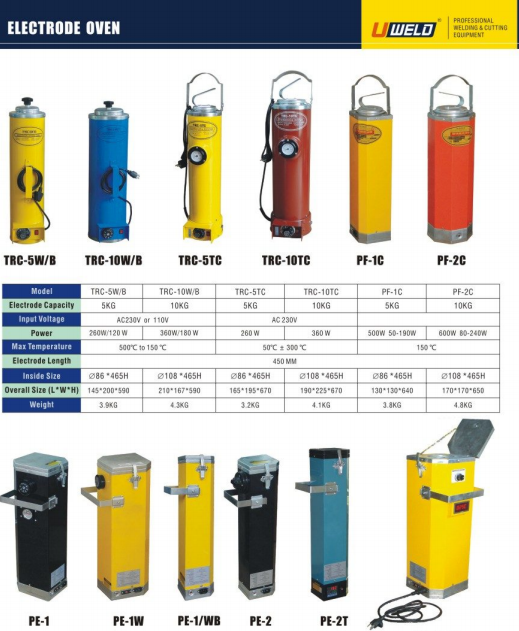 Prevent the welding seam from producing gas holes, hydrogen cracking, high quality welding effect, the cylinder can be tilted 45 degrees, easy to take the welding rod, also equipped with straps, easy to work at high altitude. Necessary tools to ensure welding quality. The welding rod oven has the advantages of simple use, etc., and is suitable for outdoor construction work and small amount of electrode drying.